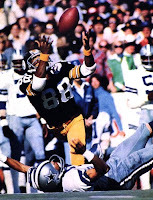 January 21, 1979 the Steelers won their third Super Bowl, Super Bowl XIII, defeating the Dallas Cowboys 35-31. 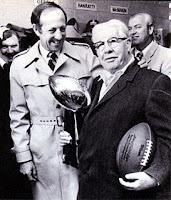 It was a thrilling game, in what we think of as the "Jackie Smith" Super Bowl (for those who saw the game, or have seen highlights you know what we're talking about). For some detailed information about the game here is the page at Wikipedia, or you can visit the NFL's official page by clicking here. As everyone knows by now the Steelers have hired a new offensive line coach ~ Sean Kugler who recently finished a two-year stint in the same position in Buffalo. The question that we all have is simple: Is this guy the answer to the struggles of the Steelers' offensive line (especially in the area of run blocking)? Time, of course, will tell; but here is a quick statistical comparison of the Steelers and Bills performance in certain key areas over the past two seasons (i.e.2008 and 2009). Certainly there may be other factors at play ~ perhaps Buffalo's running backs are better than those who play in Pittsburgh (unlikely, but a possibility); and it is very likely that the level of competition the Steelers faced (given their consistently better record) was probably somewhat tougher than that of the Bills. However, based upon theses numbers it can at least be argued that Buffalo's offensive front outperformed the one in Pittsburgh. Was it the coaching? Let's all hope so.